Quietly Musing: A Peasant's Smile ! I purchased these biconical faceted jade beads from a smiling peasant in NW China. While he was not exactly "the Leech-gatherer on the lonely moor" I could perhaps call him the bead gatherer on the loess plains and I, a bead collector from the Southern Seas (Nanyang). So when the twain do meet it is a joyous occasion and I can still recall our twin beams of happiness. However some critics may say I need my head examined to go giddy over a handful of rusty beads, see picture. 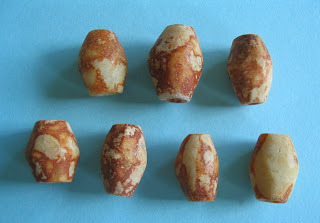 The biconical beads are plumpish and the facets are not sharp but have been blunted by time.The exterior is coated with a layer of iron rust maybe from burial with metal objects. Patina (bao jiang) and iridescence are evident on all the beads which should put these beads in the ancient category. What surprises me about these beads is the lack of any carving (or maybe it is more correct to say, grinding) on the surface of the beads, given that most Chinese jade artifacts,(not only beads) will bear some kind of carved pattern or other. It is almost de rigueur. Morover I have also read somewhere, that it is not in the Chinese art sense to facet beads. So are these ancient beads Chinese or not ? Too many doubts and questions really spoil the joy of collecting. Think I'd do better to move on to a more intriguing aspect. While the surface of the faceted beads is plain and uncarved, the decoration seems to have gone underground ! I am referring to the grind marks or tool marks present in the perforations. These are revealed as a spiral of beautifully formed and aged concentric circles down the length of the hole. Peering down the perforations with the help of a loupe, to see the "hidden" artwork of many milleniums is one intriguing experience that only an ancient bead aficionado can understand.